So you live in an apartment. Buffet-style cuisines no longer appear at the swipe of a card. You’re your own chef now. But you’ve eaten so much pasta this quarter that you find yourself growing sick at the sight of spaghetti. And once midterms roll around, even the most enthusiastic chefs among us groan at the thought of having to prepare a meal. Food? Who has time to cook when you have two midterms and a paper due tomorrow? Turns out, 20 minutes is all you need to make a cheap and tasty meal. Watch the video below for a step-by-step guide from UCLA students. Dish of the Day: Honey Chicken with Couscous. New Yorker editor David Remnick came “squinting into the California sun” today, as he put it, making a rare trip to UCLA from the East Coast. 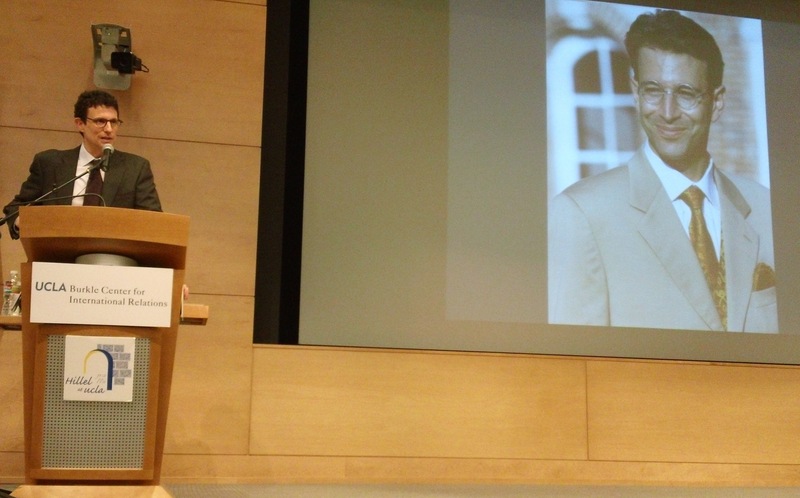 But he noted that a particularly important occasion brought him to campus — to deliver a speech in honor of slain journalist Daniel Pearl. Addressing a packed crowd in Korn Convocation Hall, Remnick called the Wall Street Journal writer “the ultimate rootless cosmopolitan,” commenting on the soulfulness of Pearl’s writing. Remnick also talked about what he called the “central obsession of (Pearl’s) personal life- freedom of expression.” Remnick touched on the pitfalls and challenges facing free speech and journalists worldwide, from China to the Arab Spring to the United States. He criticized governments for jailing journalists and forcing countless others to censor themselves for fear of imprisonment or death. The lecture was followed by an unscripted question and answer session, during which Remnick responded to audience members’ questions about hot-button issues such as the Republican debates and the online anti-piracy bills in Congress. He repeatedly spoke of the Internet’s role in enhancing freedom of expression worldwide. Since the Internet is so vast, he said, any attempt to regulate it would be like “trying to regulate molecules.” In other words — impossible. Remnick ended his speech with an appeal to journalists to continue exerting pressure on power. “Life without liberty, without access to truth … is a famished life,” he said. Reporting by Sonali Kohli, Bruin senior staff. It’s an evening of dodging lasers, sliding across gym floors and ducking behind inflatable bunkers for safety, all to the eerie soundtrack of dubstep. Just an average Friday night for UCLA students – at least for those dedicated to helping fight against pediatric AIDS. The UCLA Pediatric AIDS Coalition, which organizes Dance Marathon, hosted its second annual laser tag fundraiser in the Student Activities Center Friday night. Mojo brings you clips of the event, including some tips from laser tag participants on how to make it out of the game alive. With reports by Jillian Beck, Bruin contributor. 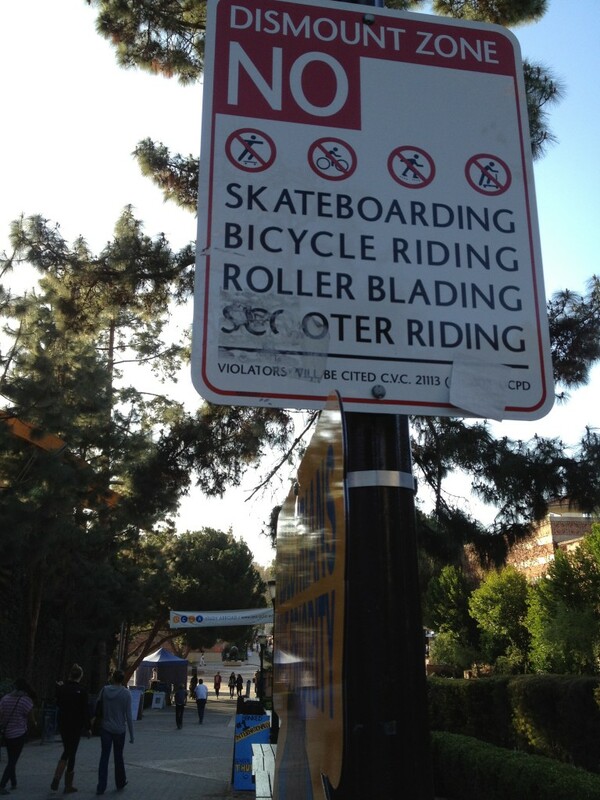 Several of these colorful signs, featuring a cheerful Joe Bruin poised to charge, are now up around Bruin Plaza, courtesy of UCLA Events and Transportation. And we have got to hand it to them: These new signs are, well, pretty hard to ignore. Standard red-and-white dismount zone signs have been up since 2009. But traffic on Bruin Walk has increased with the growing enrollment over the years, and students needed a friendly reminder, said David Karwaski, senior associate director of UCLA Events and Transportation’s Planning, Policy and Traffic Systems unit. The signs will stay up for the beginning of each quarter, but will be promptly removed after a few weeks, he added. Still, even when the image of Joe Bruin isn’t there to remind you, try to remember his message. 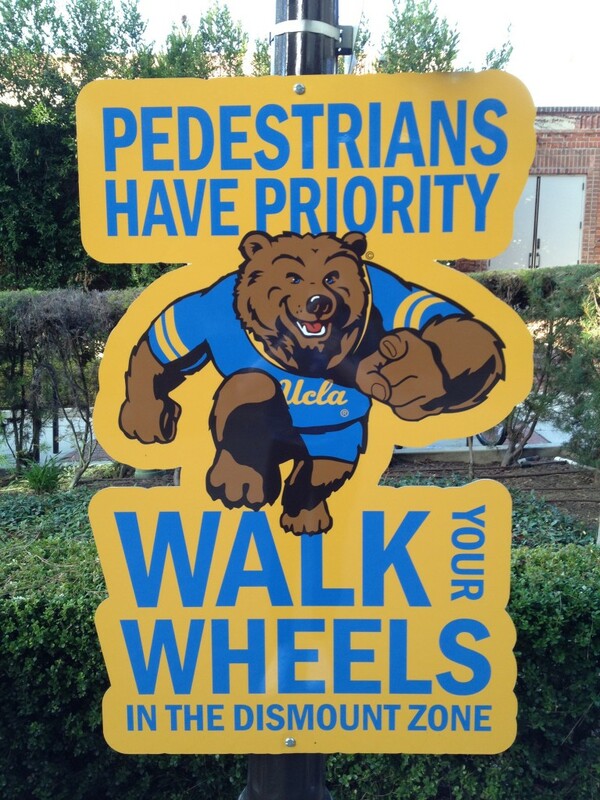 University police can fine students $202 or more if they don’t walk their wheels on Bruin Walk, Karwaski said. Did the new signs get your attention? What’s your opinion of the design? Tweets us your thoughts @dbmojo or comment below.